William Baker was born in Broadclyst, Exeter, Devon in 1802 but had moved to Yeovil by 1833. Between 1835 and 1842 he ran a beerhouse called the King's Arms in Back Kingston with his wife Elizabeth (bc 1805). Not to be confused with the later King's Arms 2 in South Street or the even later King's Arms 3 in Silver Street, this was one of the earliest of the Yeovil beerhouses. It was probably a relatively short-lived establishment as it only appears in the records for a few years - Robson’s 1835 Directory listed it as the King's Arms, Back Kingston (today's Higher Kingston), Robson’s 1839 Directory listed William Baker as a Beer Retailer in Back Kingston, the Somerset Gazette Directory of 1840 listed him at the King's Arms, Back Kingston, the 1841 census listed William as an Inn Keeper and although the pub was not named it was listed in Higher Kingston. Finally, Pigot’s 1842-4 Directory listed William as a Retailer of Beer in Kingston. Being the landlord of a beerhouse was not, of course, William's chief occupation and it is most likely that Elizabeth ran the beerhouse during the day and William took over during the evening as was normal practice at the time. William was one of several Yeovil brick makers and was listed as such in Robson's Directory of 1839, Pigot's Directory of 1842 listed him as a 'Brick Maker & Lime Burner' and he was also listed as a brick manufacturer in Hunt's Directory of 1850, Slater's 1852/3 Directory, Harrison, Harrod & Co's 1859 Directory and finally in Kelly's Directory of 1861. The Yeovil Tithe Apportionment of 1846 noted him as the occupier of Parcel 1457, described as 'Brickyard, etc' owned by John Moody. This was on Preston Road to the immediate east of the Workhouse - the site is now occupied by Westfield Road. In the 1841 census William was listed as an Inn Keeper in Back Kingston with his wife Elizabeth and their three Yeovil-born sons; William Jeffery (bapt 16 March 1836), Joseph Benjamin (b 1838) and Mark (1839-1906). Elizabeth died between 1843 and 1849 (there were five women named Elizabeth Baker who died in Yeovil during this period) and this most likely forced William to stop running beerhouse. The 1851 census listed William as a widower living in Back Kingston with his son William and a housekeeper, and he listed his trade as a 'Contractor of Roads, etc'. In the 1861 census, living in Back Kingston with just a housekeeper, he was listed as an 'Earth Contractor'. William Baker died in either 1870 or 1872. Of William and Elizabeth's sons, I lost track of William Jnr, Joseph became a Master Butcher and moved to Bermondsey, London, where he lived with his wife Jane and their children Frederick, Minnie and Jessie. Mark married Mary Ann Moon (1840-1915) and they had a daughter Jessie (1873-1961). Mark and his family moved to Australia, where he died in 1906. 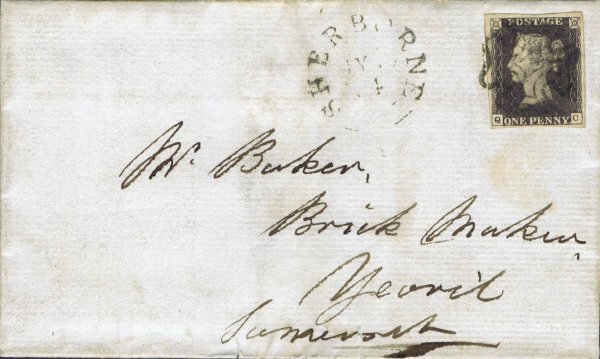 An envelope, posted from Sherborne to Yeovil on 19 May 1841 (using a Penny Black stamp of 1840) addressed simply to Mr Baker, Brick Maker, Yeovil, Somerset. This envelope was catalogued at £3,500.